Visit the Sunshine Coast Hinterland, a haven for tourists looking for fantastic beaches, adventure sports, ecotourism, and one fantastic photo opportunity after another! This five-day itinerary begins and ends in Brisbane, where you can easily extend your trip to explore the Queensland's capital city. The first leg of the itinerary takes you all the way to Bundaberg, where you can explore the Great Barrier Reef and the surrounding National Parks. After two days, you will drive south to Hervey Bay, for another once-in-a-lifetime nature experience, the best whale watching in Australia. On day four, you will drive to Maroochydore, and explore the beaches and attractions in and around this popular city. Finally, you will return to Brisbane, where you can have your pick of activities, restaurants, and shopping. Drive 365 km (5 hours, 27 minutes) north to Bundaberg, the 'Gateway to the Southern Great Barrier Reef'. Situated on the Burnett River, Bundaberg and the surrounding areas are a nature-lover's dream, with beautiful sandy beaches perfect for diving, and eight National Parks right along the coast. In order for you to enjoy the Great Barrier Reef and other sights, you will need two days in Bundaberg. There are numerous places to dive around the Great Barrier Reef, including Fitzroy Reef Lagoon, Hoffman's Rocks, Barolin Rocks, and the favorite of many divers, Evan's Patch. If you would rather stay above water, take one of the many day cruises. Some of the cruises allow time for diving or snorkeling as well. You can also tour the areas of Lady Elliott Island and Lady Musgrave Island. Check with the Bundaburg Visitor Information Center for details about the various tours available. About 15 km east of the city is Mon Repos Beach, known as 'Turtle Coast' and home to a large population of nesting marine turtles. You may be able to catch a glimpse of them after dark, so plan to come after an early dinner (check with one of the four Bundaberg Region Visitor Information Centers for the best viewing times and to purchase tickets). 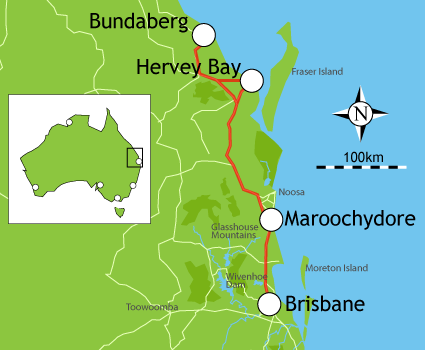 Drive about 124 km southeast to Hervey Bay. Named by Captain Cook in 1770, Hervey Bay is made up of numerous tiny townships, and is the gateway to Fraser Island. Considered one of the best places in the world to spot humpback whales, the area has numerous outdoor recreational opportunities, and a plethora of caravan parks. Every year from July through November, Hervey Bay is home to thousands of migrating humpback whales. More than 20 companies operate whale-watching tours out of Urangan Boat Harbour. You can choose full-day, half-day, and three-quarter-day tours. Check with the Whale Watch Industry Association of Hervey Bay for more information. Step back in time as you explore the 19 buildings that make up the Hervey Bay Historical Village & Museum. Thousands of artifacts date back to the 1800s, and the site includes a church built in 1910, a railway station built in 1920, a slab cottage built in 1900, and a school built in the 1800s. Some of the buildings are fully furnished. On Sundays you can see a demonstration from a blacksmith and wood turner. Hervey Bay is also well known for fantastic fishing opportunities. You can hire a fishing charter, but if you simply want to put a line in for a few hours, make your way to the Scarness Esplanade. About 18 km long, the Esplanade has numerous jetties perfect for fishing. Leave early in the morning and begin the 206 km-drive south to Maroochydore, where you will find gorgeous beaches and terrific shopping. The route winds through the towns of Kin Kin, Teewantin and Noosaville. If you are ahead of schedule, stay a night in Noosa Heads, just a few km off of your route. Here you will find a plethora of caravan parks, National Parks, and great shopping and beaches. The Maroochy Beach Caravan Parks are operated by the Maroochy Shire Council, and are located in Maroochydore, Mooloolaba, Cotton Tree, Mudjimba, and Coolum. Most have powered van sites and powered tent sites, laundry and shower facilities, vending machines, and swimming pools. www.maroochypark.qld.gov.au The Coolum location, the Coolum Cool Seas, is close to beaches, restaurants, and nightclubs. The Cotton Tree location is located on the Maroochy River, and is within walking distance of beaches famous for great surfing. The Maroochydore location, the Maroochydore Seabreeze, is an oceanfront park close to beaches, and restaurants. The Mooloolaba location is across from Underwater World Aquarium, and is within walking distance of beaches and shopping. The Mudjimba location is more quiet, features a children's playground, and easy beach access. Drive 105 km south to Brisbane, the capital of Queensland and Australia's fastest growing city. Located on the Brisbane River, between the Great Dividing Mountain Range and Moreton Bay, Brisbane is a lush city with spectacular gardens and wonderful beaches. Although this is where your trip started, you are not finished by any means. Brisbane offers visitors a wealth of sightseeing and dining opportunities, and you will need at least two days to see the top sites. Once you get settled at your caravan park or resort, visit stroll the streets of downtown Brisbane, and have a seafood dinner or a bit of 'Mod Oz' cuisine. Situated on the banks of the Brisbane River, the Queensland Cultural Centre is a series of buildings celebrating the arts. Visit the Queensland Arts Gallery and the Queensland Gallery of Modern Art www.qag.qld.gov.au, both with Aboriginal collections. Also in this arts complex is the Queensland Performing Arts Centre www.qmuseum.qld.gov.au is the place to see fossils, models of a blue whale and dinosaurs, and even a German tank from WW1.